It was very appropriate that in 1955, a new secondary school in Brighton was named after Dorothy Stringer. In her many years of service to the town Dorothy Stringer served for fifty years on Brighton Education Committee, joining it in 1923 and becoming the committee’s first female chair. Born in Brighton in 1894, Dorothy Stringer belonged to a family well known for their contributions to public life. Her father, Joseph Stringer, was an alderman, her mother Emma was a member of the Board of Guardians and a cousin, Herbert Galliers was Mayor of Brighton in 1929. Dorothy followed in her family’s footsteps and was elected to Brighton Council in 1933. 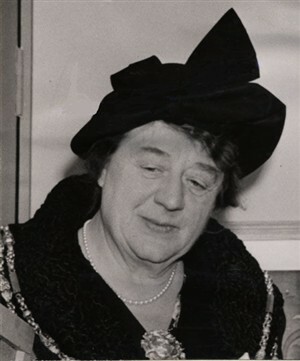 Miss Stringer was elected Mayor of Brighton in 1952 and was awarded an OBE in 1960. In 1968, on the 19th December, her record of service to Brighton was formally recognised, when she was given the Freedom of the Borough, being only the second woman to receive this honour. Dorothy Stringer continued her public service all her life, working on a great many committees into her middle seventies; she died at 77 years old. As a kid in the 50s I remember going to a function at the Dome to the Mayors Ball and met Dorothy Stringer and also received a present from her. I seem to remember there being loads of children there. .
Dorothy Stringer was on the board of governors of Patcham County Secondary School and she attended our Speech Days. In 1964/65 I was head girl and the head boy and head girl made a speech on alternate years. Unfortunately that year was the head girl’s turn. I knew I could not stand up and speak to the entire school, parents and governors and insisted that the head boy, Bruce Dingle, took my place. The headmaster agreed and so Bruce made the speech, except that halfway through his speech, Dorothy Stringer stood up and interrupted him (why I don’t know, she wasn’t commenting on his speech). Bravely Bruce carried on after her interruption, I am so glad I refused to do it, I think I would have fainted. It was of the general opinion amongst the prefects that the esteemed lady was slightly inebriated. I was a pupil at Balfour Road, headmaster ED Slater, when Dorothy Stringer visited one day during the early to mid 1950’s. I remember thinking how large she was and how her dress was like a tent, but I was only 8 or 9 then so everyone was big. She was treated like royalty on that day.